Waiting Cibus 2014, we propose you the interview of Monica Caserta to Rector of ALMA – the International School of Italian cuisine – and master Gualtiero Marchesi. The third edition of ALMA Caeseus, a national competition organized by ALMA – International School of Italian Cuisine – in collaboration with Cibus and dedicated to dairy products and professionals. Once upon a time there was the job of the cook, who then over time became what is commonly called the chef. But if the great Italian cuisine today claims celebrities arriving directly on our screens, transforming this job into the cult profession that we know, we owe it to a great master, a pioneer of high Italian cuisine, such as Gualtiero Marchesi. Il Marchesino, his restaurant in Milan, every year delights guests that attend the première at the Teatro alla Scala: we went there to interview him. Your biography reveals a multifaceted personality. You loved music and you married a concert player, but you became a great chef. A forced choice due to family tradition or vocation? Not chef, that only means boss, but cook. More beautiful, don’t you think?! I could answer that tradition and vocation have merged together and became culture. I learned, or rather I saw what simplicity was chez Troisgrois. What does it mean? It means learning how to deal with the kitchen in the right way, with grace and politeness. According to you, is this a job that you can begin to do well even when you are not so young? As a young man you’re more explosive, but after the 40s you understand better what is happening around you and within you. I have no prejudice against those who begin a new job as an old man. I think that greater peace of mind and humility do not harm at all. “The shape is matter.” What do you mean? I mean that the material is form. If you love the material, passionately, as I do, it will suggest you what to do to not distorting it. What’s the first thing to learn in a kitchen? When you started this job, which were your aspirations, your dreams, your myths? I put aside easy dreams and I decided to go back to school, noting how much there was to learn. Since then, I have not stopped. Many great contemporary chefs were your pupils. Is there anyone who you think has surpassed the master? To overtake me they must first join me. I’m still on the run. Your most important lesson was to give up Michelin stars, “the passion must not be subject to a vote.” Right, but then how do you avoid the scams to tourists? Everyone should examine one’s conscience. However, I support the Japanese way, where the chefs specialize and aim to do well in the same menu for all their life. Only a few of them become teachers and then are allowed you to do everything. 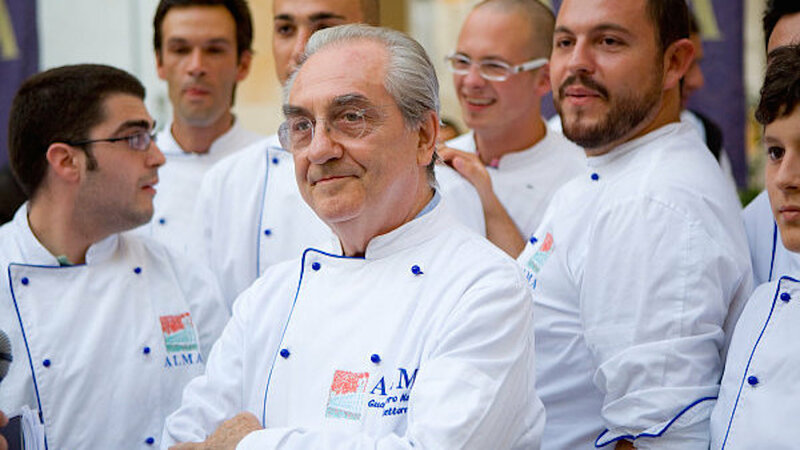 A question to Gualtiero Marchesi as a Rector of ALMA, the International School of Italian cuisine: What features should have a good chef to succeed in this job? Once I answered that it takes passion and intelligence. Now I add even love, the fundamental element. My flavours of childhood are those of the bowl of soup eaten on the doorstep when I was evacuated to San Zenone Po, the town of Gianni Brera, or chicken cassouela with cabbage. And above all the flavours of the fresh water of the well, taken with the ladle from the bucket. Today I love spaghetti. They are extraordinary, just dressed with the bare minimum.